For the moment, there are still rebates for purchasing and installing certain types of solar systems in your home or business. Also, for the moment there are still rewards given for what ongoing energy you feed back to the grid with your solar system. With regards to Rebates & FIT, there is a high degree of debate and controversy over the rewards and the perceived to actual benefits Australian’s receive when installing solar systems. The rebates and reward sizes vary greatly and often perceived payback is not necessarily as good as what people think or have been advised in the past, specially when compared to the actual price of full cost electricity which is continuously rising. It is strongly recommended that people considering installing solar systems understand how the current rebates and rewards will actually benefit them and understand what type of systems are available to actually suit their situations and energy demands. Renewable Energy Certificates (RECs) otherwise known as Small-Scale Technology Certificates (STCs) are an electronic form of currency created by the Renewable Energy (Electricity) Act 2000 also known as the Renewable Energy Target (RET scheme) which is a Government initiative to achieve a target of sourcing 20% of energy from renewable sources by the year 2020. Create the RECs yourself by finding a buyer and then selling and transferring them in the REC Registry. The rebates were created under the assumption that your solar PV system is likely to remain functional for certain deeming period blocks of time. In order to claim RECs for the full 15 year deeming period upfront – which is the most common option – your designer/installer and the equipment used, must be accredited by the Clean Energy Council (CEC). The level of rebate also depends on a number of factors, including the location (also known as the zone) of the solar PV system, the size of the system and the price of RECs at the time the system was installed. Australia is divided up into various zones based on how much renewable energy can be generated by a solar panel in a given area. So the same sized system installed in Melbourne or Hobart (Zone 4) receives fewer RECs than those installed in Sydney (Zone 3) or Darwin (Zone 2) because Melbourne and Hobart have less sunshine so less solar energy is produced. We at Solar Heroes pride ourselves with providing you the most up to date information relevant to your situation. We help you make informed decisions for what suits you. For help or questions on any of the information mentioned here, please feel welcome to contact us. Feed in Tariffs are a payment to you for the clean energy that your solar panels feed back into the grid. There have been many changes to feed-in tariff legislation in all States and Territories over the past 18 months so please make sure that you check within your local area to see what tariffs are available to you. FIT was advertised to encourage homeowners to install solar systems to combat the ever increasing cost of electricity. Homeowners and tenants have experienced a whopping 80% increase in electricity prices over the past 5 years and the ever increasing rise in electricity bills is not showing any signs of slowing down. Electricity prices are set to increase further in 2014 and again in 2015 by up to an additional 22%. Comparatively, once generous FIT rates have been reduced across all states. As an example, earlier when the FIT system was introduced, Australians were rewarded with 66c per kWh. This 66c rate can no longer be found and people who have been rewarded and still hold this rate have been given very strict conditions in order for them to remain on the 66c FIT rate. If they move house the rate cannot be carried over to the new premises. The 66c rate agreement cannot be transferred to any other names. Also, any changes to equipment or system sizes voids the 66c FIT rate received. People moving off the old 66c rate or newly purchasing a feed in type of solar system will find new rates either non existent or as low as 5-8c. This does not mean that people cannot benefit from FIT, they simply need to see what rates are available to them at the time of considering a system and also understand the various types of solar systems available to them as grid tied solar systems may not necessarily be the best option. Next we talk about incorporating a battery bank into the grid tied system to offset peak time usage, sun electricity generation to times when you actually need it. Current Explanation of the benefits of installing a battery bank in your home with the FIT rates. In the diagram below, you will see how the excess energy you generate without batteries is sold back to the grid. During the middle of the day, while you are at work and the sun is at full capacity is when you see the energy you generate sold back to the grid. The areas in red are still charged at full price to you from the grid and the area in yellow is the full price electricity you used discounted by the energy you generated by the sun. 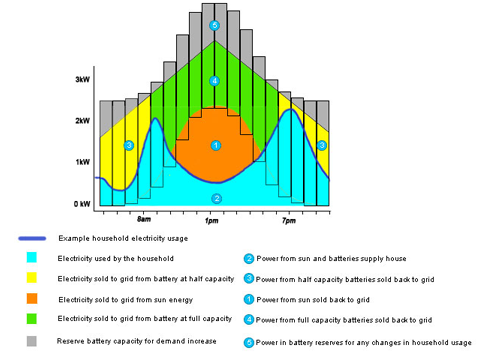 In the diagram below you will see how the excess energy you generate with batteries is sold back to the grid. 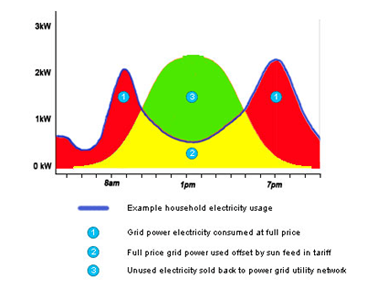 This example shows how electricity is sold back to the grid at all times of the day using a full scale battery bank illustration. You will also note that with the full scale battery bank, there is no grid power being consumed by the household which means that all electricity consumed (2) is self generated. This means that the electricity sold back to the grid should appear as a 100% credit on your electricity bill therefore offsetting the original cost of the battery installation. For more information on battery powered implementations, please see our Battery Powered with Grid Backup explanation in our packages section. You can also get more detailed information on the stages of battery power implementation here. So as you can see there is a significant level of research needed when trying to understand the rebates and feed in rewards available to you. We at Solar Heroes do our best to keep the information we have up to date and we strive on making the information we display as helpful to our readers as possible as we want to help you make the best choice for you and our future. Please note that the information and diagrams on this page are based on example information and that you should consider this advice as for illustration purposes only. Each real circumstances have different patterns of energy use and system sizes. If you would like more information on any of the above mentioned details or to speak to our staff on options for your specific situation, please contact us.